Lion Brand has been a mainstay of the knit and crochet world for many, many years. 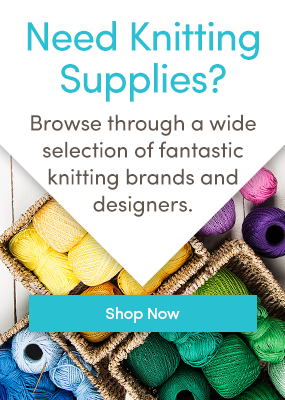 One of the things they’re known for is their massive catalog of free patterns, which range from the most classic of knit sweaters to the wackiest of toys and accessories. We’ve gathered ten of the most funky and unique Lion Brand knitting patterns for you this week. The Stitched Up Scarf looks like a basic stockinette stitch piece, but appearances can be deceiving. The main body, made with Vanna’s Choice, is actually knit in the round, then flattened, and Wool Ease Thick & Quick is used to embroider through both sides, which creates visual interest and holds the whole thing together. The Fair Isle Capelet is unique and beautiful, with an intricate pattern that is sure to stand out. Knit in Wool Ease, this piece is a bold statement item, sure to attract attention and compliments every time you wear it. The Jolly Roger Poncho features a cool skull and crossbones on the front, adding some edge to a classic item. Made in Wool Ease Thick & Quick, it will work up fast and be warm and cozy. The NYC Skyline Afghan takes a traditional item — a blanket — and kicks it up with colorwork in the shape of the Manhattan skyline. Use Vanna’s Choice in several different colors for a truly unique statement piece in your home. Your little writer will love Arthur, an oversized stuffed pencil. This piece uses both Wool Ease Thick & Quick and Hometown USA, plus stuffing and optional eyes, to make this fun toy. These Dragon Bookends would make a cute addition to anyone’s library, from babies to adults. Made with Vanna’s Choice, felt for the features, and googly eyes, these slip over a basic metal bookend and add a touch of whimsy to your shelf. These Child’s Snake Socks are a hilarious accessory for the kid in your life. Made in Wool Ease, they’re a quick project that any child will love to wear. The Cat Headband and Wrist Warmers are a cute and fun accessory set for all ages. These use Vanna’s Choice, and would make a great project for a quick costume, or you can just make the wrist warmers for a whimsical every day item. These Witchy Hands would make a great final touch for a costume or, if you can get used to the long nails, a funny touch in winter. Knit in Vanna’s Choice, these are worked like regular gloves, but with an i-cord forming the extended fingers. The Dog Octopus Costume is perhaps the most entertaining of the unique patterns. Made with Vanna’s Choice, this piece is worked like any other dog sweater, but with the addition of tentacles along the sides. What’s your favorite Lion Brand pattern? Tell us in the comments! My favourite Lion Brand pattern would be the Entrelac Cowl. Luxurious and practical, I made one for my sister a couple of Christmases ago, using the unfortunately discontinued Kodiak, from Berroco.